The eagle and bee, emblems of the First and later Second Empire, have become so familiar that it is easy to forget their origin and meaning. Proclaimed Emperor of the French on 28 Floréal, An XII (18 May, 1804), Napoleon approached the problem of the emblems of sovereignty on 23 Prairial (12 juin) during a session of the Conseil d’Etat. The choice of the new symbols so as to make a clean break with the monarchy of the Ancien Régime proved difficult. Crétet proposed successively an eagle, a lion and an elephant. Cambacérès preferred bees since France was a republic with a head, like a hive; Ségur thought that a lion would be better, stronger than the English leopard; Laumond was for the elephant, ” the strongest of animals “; Duroc preferred the oak and Lebrun the fleur de lys, which he felt was the emblem of France and not the Bourbons. The Conseil d’Etat finally went for the cockerel, but Napoleon preferred the lion. 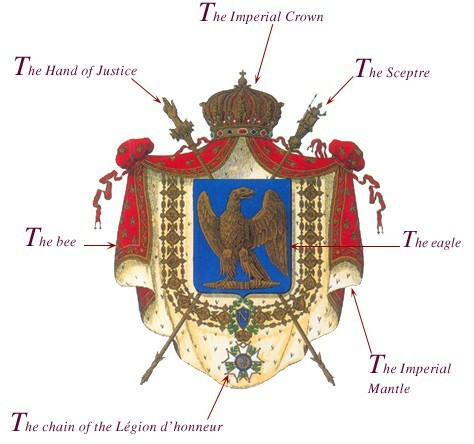 However, on 21 Messidor, An XII (10 July, 1804), the emperor crossed out the lion from the decree instituting his seal and coat of arms and imposed the eagle. Developed by Denon, Gay and Biennais, the ‘armes de l’Empire’ (Empire coat of arms), taking their inspiration from both Ancient Rome and Charlemagne, were re-used largely unchanged by the Second Empire. he principal element of the new shield, this symbol of imperial Rome, Jupiter’s bird, was associated from the earliest antiquity with military victory. The decree of 10 July, 1804 stipulates that the coat of arms of the emperor should be: ” d’azur à l’aigle à l’antique d’or, empiétant un foudre du même ” (azure with a gold, ancient eagle clutching a thunderbolt of the same colour). This eagle, very different from the motifs of traditional heraldry, also took elements from the Carolingian eagle. The day after the coronation, Napoleon had an eagle placed at the top of the shaft of every flag in the Napoleonic army. Symbol of immortality and resurrection, the bee was chosen so as to link the new dynasty to the very origins of France. Golden bees (in fact, cicadas) were discovered in 1653 in Tournai in the tomb of Childeric I, founder in 457 of the Merovingian dynasty and father of Clovis. They were considered as the oldest emblem of the sovereigns of France. Created on 29 Floréal, An X (19 May, 1802) as a decoration for military and civil services, the Légion d’honneur took its name from ancient Rome. The chain of the Légion d’honneur, reserved for the emperor, princes of the imperial family and grand dignitaries, is composed of a gold chain made of 16 trophies linked by eagles with the ribbon and cross of the order at their necks. This chain is bordered on either side by a small chain alternating stars and bees. The central motif, the Napoleonic N, is encircled by a laurel wreath and supports the cross of the Légion d’honneur, a five-pointed pommel-pointed star, in white enamel. In the centre is the laurel-crowned profile of the emperor, the whole surmounted by the imperial crown. Both ” Honneurs ” of Charlemagne and re-used for the coronation of 2 December, 1804, the hand and sceptre appear (crossed) on the imperial coat of arms. The sceptre, the baton of command, sign of sovereign authority, is that of Charlemagne and at the end is mounted a statuette of the first Emperor of the West. The reconstituted Hand of Justice is a stick mounted with a ivory hand which gives a benediction. The escutcheon stands out from the imperial cape which is similar to that used by the peers of France. Scarlet velvet spread with bees, and bordered with grape clusters, gold fringes, the cape is lined with ermine and is held in place by the crown made of eagles with raised wings alternating with arcs, the whole topped with a globe bearing a cross.